Wall clocks come in many different styles, sizes and options and are made by many different manufacturers with different price ranges. Indeed, you're sure to find the "gift of time" with our huge selection. Yet with so many different wall clocks to choose from the selection can be overwhelming. We understand that not everyone is an expert on wall clocks, including many who sell online. Therefore, we have briefly tried to offer some general wall clock information on this page and throughout our site from our years of experience in selling and repairing wall clocks and answering common questions. Our experts can also be available to offer further insight and specific model recommendations. Moreover, as an authorized service center for many manufacturers of wall clocks in the world, we can provide continuing technical service support on many wall clocks purchased from us. Wall clocks featured on our site vary in styles, from traditional and contemporary to reproduction styles. Within some of these styles are designs that feature weights and pendulums. Popular designs also include the wrought iron look. These styles will generally include the option of either a mechanical movement or a quartz, battery-operated, movement. Some of these styles will also include a chiming melody option. Traditional wall clocks generally consist of wood cases. They may also come with a pendulum and some also feature finials or moon dials. Pendulums, finials and moon dials help give traditional wall clocks the look of a grandfather clock but still maintain the space and convenience of wall clocks. Perhaps the most complementing feature of many traditional wall clocks are the chiming melodies many are offered with. Such historic chimes for example as St. Michael, Westminster and Whittington are still used today in many traditional wall clocks. Although triple chime options are generally reserved for higher-end mechanical movement wall clocks, many traditional key-wound wall clocks will still feature the popular Westminster melody. Traditional quartz wall clocks that feature a chiming melody will generally offer a dual chime option, such as some of these chiming wall clocks. Yet traditional wall clocks with a mechanical movement can generally be considered a true heirloom wall clock. 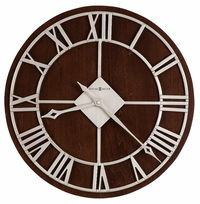 Contemporary wall clocks may feature a wood/glass combination or plastic. Although contemporary styles may also include wood cases, they may offer a twist to traditional styles with the finishes or, in some cases, curved glass doors. 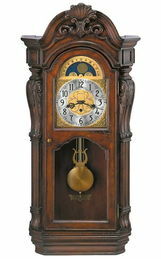 Although contemporary wall clocks may include a pendulum, many do not feature chiming melodies. Most of the contemporary styles will be found with quartz, battery-operated, movements. Popular contemporary wall clocks featured on our site include the Hermle designs with the frosted dials. Wall clocks with reproduction styles offered on our site feature reproduction designs from as early as the seventeenth-century. Indeed, wall clocks by Rombach and Haas include such interesting designs from this time period and their collection is rich in history. Reproduction wall clocks by Timeworks also offer some other interesting models where even a casual observer would be impressed. 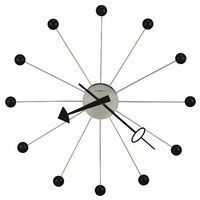 Reproduction wall clocks featured on our site include mechanical movement styles from Rombach and Haas and quartz, battery-operated, movement styles from Timeworks. Wall clocks featured on our site can also vary greatly in size, which makes it great for finding the right clock for the livingroom, family room, bedroom, kitchen or office. Gallery wall clocks, in particular, feature a range of common sizes from 20 inches to 49 inches.The price ranges are also varied. Generally, mechanical wall clocks will be priced a little higher due to the costs involved in the heirloom quality of the movement. Chiming wall clocks are also generally priced a little higher and additional costs are associated with these respective options. Wall clocks we offer generally include either a mechanical movement or a quartz, battery-operated, movement. Mechanical movements generally need to be wound with a key or by manually pulling the weights up for chain-driven clocks. The frequency of the winding for mechanical wall clocks we offer can vary depending on the clock but will generally be done at least every week. Please refer to each of the respective product descriptions. Please also refer to our section on how clocks work and the page on clock chimes. Quartz wall clocks, however, do not require such winding but the batteries should be replaced at least once a year. 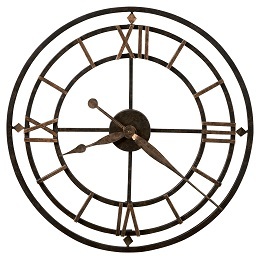 Wall clock brands we carry include Howard Miller, Hermle and Comitti. They are very reliable and have good warranties. See our page on clock info for more detailed information about each clockmaker. Another great resource for wall clocks is the National Association of Watch and Clock Collectors. We have been longtime members and their site includes a member section that provides a list of clock repair professionals in each state.